In menu choose File -> Settings, then choose Plugins item in the dialog. Press Browse repositories button and find TeaVM plugin in the list. 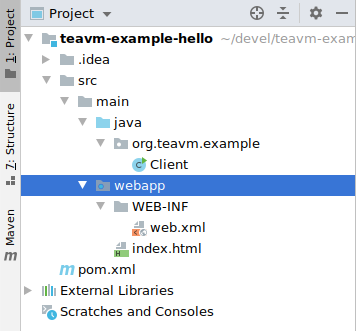 After you install TeaVM and restart IDEA, you are ready to create a project. Create a new project from terminal using Maven archetype, as described in Getting started section. Pick Run -> Edit configurations… from the main menu. Push plus button and choose Tomcat Server -> Local. Open Deployment tab of a newly created launch configuration and add a new artifact to the Deploy at the server startup list. Please, choose exploded artifact. Now run your launch configuration. IDEA automatically opens browser with your application. If everything is ok, you should see the text: TeaVM generated element. In the Run tool window push Update application button and choose Redeploy action. Follow http://localhost:8080/hello in the browser. If you saw the greeting message, everything is ok.
Again, push Update application button and follow to the browser which should now show your application with working button.